The International Society for Research on Aggression (ISRA) is a professional society of scholars and researchers engaged in the scientific study of aggression and violence. The Society is both interdisciplinary and international, with biennial meetings that alternate between North America and Europe and, most recently, Australia. Members come from several dozen countries with disciplines including anthropology, behavior genetics, criminology, education, ethology and animal behavior, neuroscience, political science, psychiatry, psychology and sociology. The ISRA website is intended to serve three primary functions: First, it is a medium of exchange for aggression researchers. As such, the website provides the opportunity for scholarly discussion on relevant topics, dissemination of research from ISRA’s official journal Aggressive Behavior, exchange of pedagogical information for teaching about aggression, and interaction via social media. Second, the website provides information about membership, its mission to support new aggression scholars via our Young Investigators Program, the history of ISRA, past and future World Meetings, previous Presidents of the Society, and ISRA Bulletins dating back to 1999. Third, the website provides information for the public interest in the form of brief articles on relevant topics as well as content and resources relevant to current events. The human capacity for aggressiveness and violence inflicts an awesome burden on society. Obviously, it is a direct cause of death and immediate physical injury, but it also creates long-term emotional and physical disabilities. It also impacts those who witness the violence, and the families and communities of the victims. It is of critical importance, although all too often unrecognized, that the impact of violence on communities impairs the ability of those communities to effectively address important public health issues, such as infectious diseases, malnutrition, urban decay, and environmental hazards and to deliver critical public services, such as public education and emergency management. Given the complex and pervasive effects, it is clear that finding solutions to aggressive and violent behavior will require the dedicated efforts of scientists working together in a truly interdisciplinary spirit. Research must address brain and other physical processes that underlie the human capacity for violence, the psychological processes that facilitate violent actions and that can provide alternatives to violence, and the social factors that serve to promote or prevent violent behavior. This multidisciplinary approach must also move beyond the simple awareness of findings in other disciplines to the active incorporation of these findings into research that spans multiple disciplines. The International Society for Research on Aggression is the only interdisciplinary and international organization dedicated to the dissemination of information regarding the causes and consequences of, and solution to, aggressive behavior, in all of its forms and contexts. We are a diverse group of scientists drawn from many different disciplines, including representatives from neuroscience, behavioral endocrinology, psychology, psychiatry, sociology, criminology, and behavior genetics. Recent findings across these different disciplines and different methodologies have demonstrated important and promising areas of convergence. 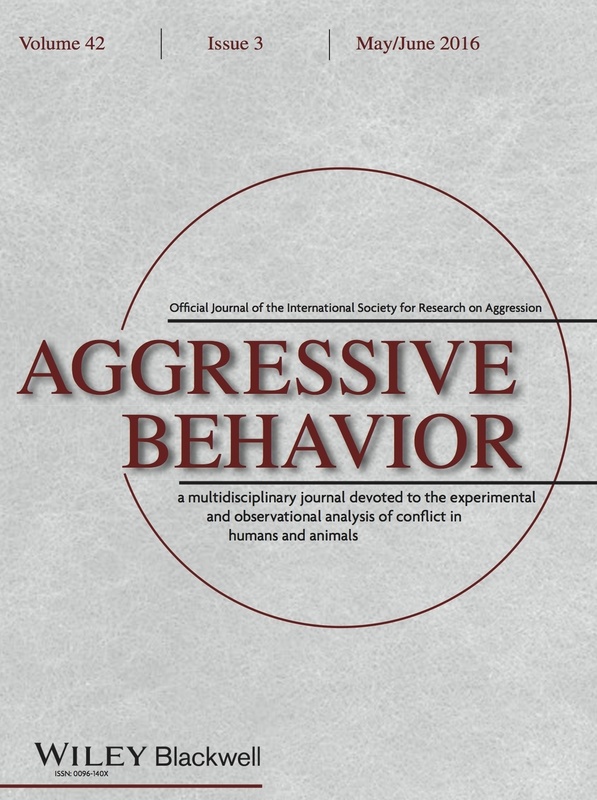 The fundamental purpose of ISRA is to provide the forum and the interdisciplinary audience through our meetings and our journal, Aggressive Behavior, where such studies can be placed in a broader framework to facilitate the emergence of research with promise to impact human violence. Because addressing the issue of aggression and violence will take a persistent concerted effort, it is vital to develop young scientists to take up the challenge of a career in this interdisciplinary field. Therefore ISRA is devoted to encouraging younger scientists to develop an interdisciplinary perspective on aggression. Moreover, because violence knows no borders, the effort must be international in scope. Excellent basic research is being conducted throughout the world, and the knowledge gained through this research must be made known. In addition, the findings of researchers studying violence in different cultures and social contexts provide extremely valuable insights that can strengthen the research and practice of researchers in other cultures and contexts. ISRA is dedicated to a truly international approach to aggression and violence. Because some of the most pervasive violent actions occur in countries with few resources, ISRA promotes the participation of scientists from such countries. Effectively addressing violence and aggression, whether it be child abuse, domestic violence, homicide, terrorism, sexual violence, or civil wars, requires a committed and sustained focus by international scientists. This has been ISRA’s mission for more than 35 years, and we need your help to continue our efforts to provide an international, interdisciplinary forum dedicated to the eradication of aggression.